The lead up to the next movie begins here! 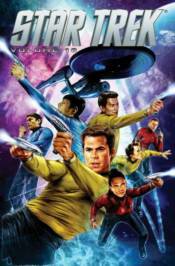 Following their encounter with the extradimensional entity known as 'Q', Captain Kirk and the crew of the Enterprise continue their five-year mission into unexplored space. Contains the stories 'Behemoth,' 'Eurydice,' and 'The Tholian Webs' from issues #41-46.